Here’s a quick overview on our latest product updates we’ve been working on over the last week to improve your RealSpace experience. Want to send out an important announcement or message to all your users? 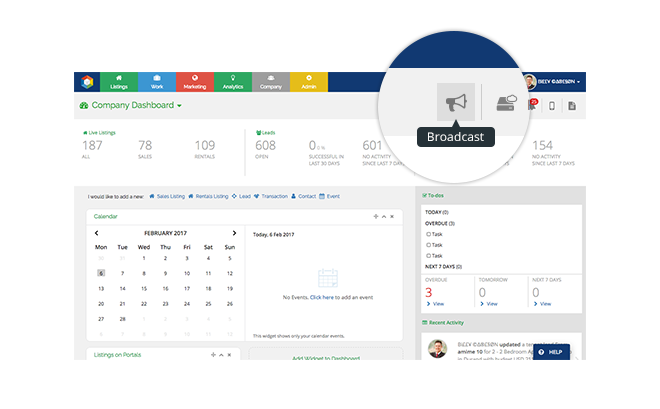 The broadcast tool allows you to compose and send a quick email to all your active users in RealSpace. If your company has branches, you can even select to broadcast your message to individual branches rather than every user. Who doesn’t love shortcuts? Now you can quickly create a new transaction/deal directly from the listing module, and we auto-populate as much information as possible. We believe it is essential to collaborate and manage corporate document templates, especially across multiple branches of an organisation. 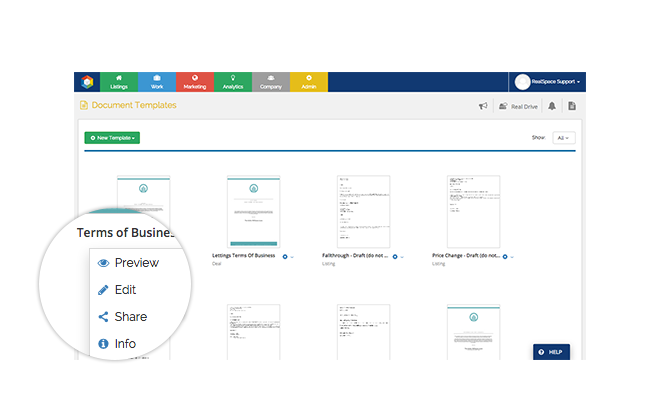 Seamlessly share your document templates with any or all branches, assuring a global document library is always maintained within your organisation. Get the Tactics and Techniques No Estate Agent Should Do Without! I used to sell swords on military bases. Yes, people actually do that. When I say swords, I mean giant blades from movies like Lord of the Rings, Braveheart, and Game of Thrones. Held in a five-blade rack and gleaming under the lights, the display was quite impressive. My coworker and I looked like knights of Arthur’s table, ready to help passers by pull a sword from the stone. And we were ready to help. Because despite their outstanding appearance and plenty of blade lovers on base, the swords didn’t jump of the rack. We had to sell, sell, sell. Our lead generation strategy was the oldest in the book: the cold approach. Like door to door salesmen in the past, we approached servicemen and women and hooked them into our display and hopefully, a sale. But we didn’t know if steel-eyed Marines, high-flying Airmen, or Navy Seals would be interested until we approached them and asked. It could be…ah…intimidating sometimes. Fortunately, lead generation strategies have evolved and today we’re not talking how to sell swords – but real estate. These days, technology affords estate agents a diverse array of tactics and techniques for generating leads. Estate agency software provides an adaptive, dynamic, and resourceful interface for connecting estate agents with applicants, vendors, and coordinating sales with premier instructions. 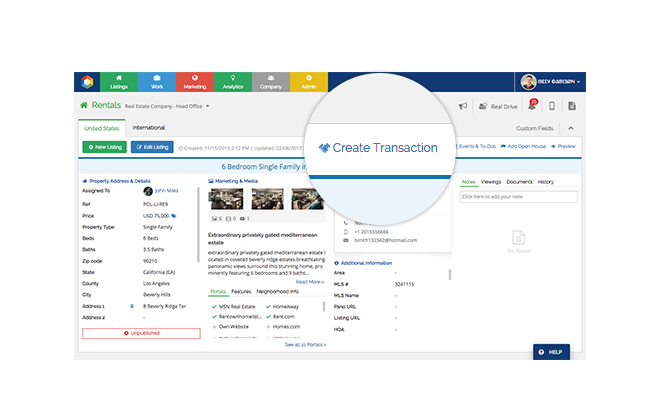 Now you can get a 360-degree view of leads with detailed information, cloud integration for easy file sharing and access, an easy interface, plus sales and marketing automation capabilities. But even such robust features, the eternal question remains: where are the leads? Let me show you. Read on to discover 5 winning online lead generation strategies that use your real estate CRM to maximize not only lead generation, but lead conversions and sales. Time to sharpen the blade for lead generation. En guard! Exclusive Bonus: Download this Essential 17-step Questionnaire to ensure you make the right choice in a real estate CRM! To attract the best leads, you’ll need to provide highly valuable content about your properties and the surrounding areas. By doing so you’ll appear as an authority in your market and earn visits from those seeking quality information. The best place to do this is on your website, the hub of your marketing efforts. As we see above, Anita Clark of Warner Robins makes her website a fact-filled resource for visitors. Providing ideas and painting a picture of daily life goes a long way to attracting and converting new leads to homebuyers. Once visitors have landed and perused your site, signed up for your newsletter, your real estate CRM will then automate your drip marketing efforts to reach them once they’ve visited. But what constitutes valuable content for your website? Just ask your clients. Get local when talking about features and amenities in the areas of your properties. Put yourself in buyer’s shoes: what would I want to know if I was going to purchase here? By answering specific pain-related topics, you’ll stay relevant with consumers and receive more site visitors and lead inquiries. Your SEO page ranking will also increase, and thus your web visibility. Besides the blog, what other types of content show value for site visitors? Case studies: As we know, estate sales is a ‘show me, don’t tell me’ business. Before you bring leads to a property, you can use case studies to boldly illustrate the benefits waiting for those considering a purchase. First, tell an engaging story that centers around difficulties facing a buyer or seller. Then talk about how your provided solution to the challenge resulted in a successful purchase and a happy ending for everyone. Customer testimonials: People love to hear word of mouth and are very much influenced by the experiences of others. In consumer psychology, this is known as social proof. To take advantage of visitor’s willingness to trust former buyer’s, place testimonials throughout your website, such as footers of web pages and content such as blog posts, and case studies – even social media posts. Focus upon delivering value-laden feedback for best effect. Real estate is about building relationships and social media is the greatest tool available for starting new relationships. Younger buyers spend heaps of time on social, so if you’re not already online, you’re quickly falling behind. Facebook is a great way to enhance your web presence organically with regular postings – plus – you can utilize paid ads to generate leads. The targeting range with Facebook ads is outstanding, allowing you to promote new listings, open houses, and provide glowing testimonials of past sales. You can create a customer audience across a huge range of demographics to target existing leads in your database. Or simply boost your post to locate new leads in your market. As we can see above, Knight Frank of London showcases a new flat while providing plenty of charming photos and contact details. An effective lead generation tool, running ads based on user demographics can hugely increase the amount of qualified traffic to such a listing. Want a marketing hack? Set up individual landing pages from each ad you post. Why? Every time someone engages with the ad they’ll arrive at a listing-specific page connected to your website. Here, treat them to a more in-depth showing. Use this opportunity to subscribe them to your email list and to engage them with future automated marketing messages via your estate agency software. Once they’ve visited your website, visitors are primed for remarketing, or retargeting. Google Adwords and Facebook both provide retargeting which allow you to re engage visitors who’ve shown interest in properties as they search the web or browse Facebook. And what’s new in social media? With all the advertising capabilities of Facebook on a more visually oriented platform that offers video options as well, real estate agents are waking up to the reality that Instagram’s 400 million active daily users are engaged and ready to find what they need. Simply adding a link in your Profile Bio up top and directing users to it can net you fresh leads. A huge part of lead generation today is actually lead nurturing. And capturing leads is the first step in lead nurturing. To effect this, lead capture form on your website and landing pages should be direct and easy to use. As we see above, a good lead capture is basic but prompts visitors to provide a few details which can be used later to refine their search. Not everyone who visits your site will share their email right away, but after browsing site listings, reading blog articles, and repeating this process a couple times, most interested applicants will. The real estate CRM is the irreplaceable tool for parsing prospects that arrive to your website from the qualified leads. Once you’ve captured a prospect’s information with a landing page on your site – whether via paid ads or organic search – you can monitor their behaviors through your drip marketing campaigns. For example, say a site visitors signs up for your newsletter. Your real estate CRM catalogues this prospect. Your estate agency software then sends this prospect a welcome email following signup – to show you care and prepare them for what’s to come. The visitor, whether through the newsletter or a fresh site visit, then proceeds to click through to view a couple of listings. An agent then makes a note of this website listing interest after receiving an automated email alert that the lead is active online. What if the lead downloads a case study? The agent gets another email. The CRM keeps the monitoring agent up to date with all activity – remotely, and without effort. By monitoring lead activities as they move down the funnel, agents can see when’s the best time to jump in and manually nurture or connect with potential buyers. The CRM is a gateway to realize more and more opportunities. It also shows us the ideal time to meet these lead in person. Yes, inbound marketing efforts are the long game. But are you resigned to churning through mounds of unqualified leads before finding sales qualified leads? Not at all. You can accelerate your buying cycle and segment your email list by assisting leads find the right information at the right time. Use regular newsletters to connect with prospects and inform them about upcoming events, relevant real estate information, and local real estate information. Depending on existing data from leads after a lead capture, your estate software will deliver leads any number of emails (not too many!) that they’ll be interested in. Prospects that don’t engage with emails are not going to convert soon. But those who download case studies, click through your “Hottest Listings,” or read about mortgage rates are ready and willing to receive more nurturing content. Segment these leads as qualified and target them with bottom-funnel content. With your estate software, drip messaging is all automated, the responses and click-through rates monitored, and lead personalities developed without lifting a finger. When leads have traversed the funnel towards the bottom, you can auto-assign leads to agents for follow-up and personal attention. Most real estate portals will have their own lead generation and advertising program for estate agents. As a paid option, these are more costly options than social media ads or drip marketing, but nonetheless reach a very wide audience of very engaged consumers. To make lead generation easy, RealSpace syndicates with these portals, including Zillow, Trulia, Rightmove, Zoopla, Wall St Journal, Mansion Global, Juwai, JustProperty and many more. When your real estate software integrates with these platforms, your lead generation efforts become more targeted and your web presence catches a boost from being associated with such widely trusted entities. Sometimes lead generation feels like trying to pull a sword from a stone. But with an estate agency software solution, you needn’t be a king to rule your lead generation efforts. After all, your real estate CRM unites your online marketing presence, automates the inbound processes, gathers key datasets for leads, and frees your agents up to simply sell. With so much time free to follow up with qualified leads, expect your estate agents to close more deals, more often. As we discussed today, the core element of your online lead generation efforts is surpassing content. With valuable resources at hand, your social media presence can flourish as visitors return to your website, share their email address, and become part of e automated drip campaigns. With optimized lead capture forms and individual landing page established, your estate agency software will effectively manage your inbound marketing. Lastly, paid campaigns on property portal sync up with your RealSpace platform. Now you’re ready to take up the sword and make sales. What an incredible year 2016 has been for RealSpace! The team has been hard at work developing features that provide massive value to real estate agents across North America, the UK and beyond all so they can grow their real estate business. One of the most consistent pieces of feedback we received in 2016 was how clean and easy to use RealSpace was. While maintaining a clean user interface the team managed to add a whole host of new features, and we’d like to give you a run-through of some of our major releases last year. Think Google Drive but tied to your CRM. Real Drive allows you to keep all of your real estate documents in the place where you manage your business. We currently support: .pdf, .doc, .docx, .jpg, .png, .jpeg, .ppt, .pptx, .xls, .xlsx, .mp4, .mov, .zip, .gz, .eps, .ps, .psd, .html, .htm, .txt, .rtf, .gif, .ai and .svg files. Do you know those documents you’re constantly having to fill out for every buyer and seller client? Imagine if you could auto populate all of your client’s basic information for the Contact record into the form so that all they had to do is sign it. That is what we designed Document Templates for! Let’s say you receive an online lead from Zillow, instead of sending the lead just one automatic reply, that lead can be added to a series of relevant content over a period of time you determine. The benefit of a drip approach, versus a single email, is you can go deeper with each piece of content. Think about using drip marketing campaigns for new buyer leads, seller leads, or nurturing a client post-closing. Transaction Management is a step-by-step checklist of tasks that need to be completed during the transaction process. A checklist can be created on the fly or a pre-established checklist can be selected from a library. During your “hour of power” calling on your database to generate listing appointments you make contact with someone you’ve been trying to get ahold of for 6 months. They agree to meet but ask for a call in two days to set the appointment date and time. Where do you put that reminder? In your calendar? Yes, you could but you wouldn’t have a record of it in your CRM. If you use RealSpace to set the appointment you’ll kill two birds with one stone—by recording the conversation and setting a reminder in your CRM, which automatically pushes it to your Google Calendar (or any other calendar you use). Automation allows you to trigger things like auto-responses to new leads and put past clients into a drip marketing campaign without you having to lift a finger. Have a peace of mind to know that when you are at a listing appointment or meeting with a referral, work gets done for you automatically. A gorgeous looking website is one of the most important parts of building a brand as a real estate professional because it is typically the first impression a prospective client has of you. It can be easy to find someone to design a great website, but more difficult to have that website talk to the MLS and your CRM – we solved that problem with our new website templates. They’re mobile responsive, modern, and incredibly affordable. We know that making it easy to share your properties across multiple portals saves you time. Because of this, connecting with the major portals from around the world is one of the best ways we can help you get as many viewers on your properties as possible. We’ve started off with some of the best-known leaders in property syndication and will continue to build out others as requested. We’ve integrated with one of the leading solutions for phone dialers, PhoneBurner, to help you make more calls with less time. With the integration you can create a call list, call through numbers without manually dialing, leave pre-recorded voice messages, and more. What’s to come in 2017? 2017 is going to be a massive year for RealSpace! We can’t wait to show you some of the things we’re working on. If you have not signed up for a 2 week trial, you can get started HERE. Have a question for us? Send us an email here or chat with us online. We look forward to hearing from you. Every real estate organization has seen a Marc Roberts. Not in a literal sense, that would be weird. I mean that every team has a highly motivated, energetic individual with endless potential and exceptional people skills. Great teams are full of people who match this description. But to me, Marc Roberts is a cautionary tale about the need for organization skills to match such traits. I knew Marc in college. We graduated together and got into the real estate industry around the same time – the economic downturn of 2008. Yes, as you can imagine times were hard to start. While we strove to overcome the grim reality of the housing market, we had to get creative with our efforts. We began marketing in new ways, expanding our networks with diligence, and taking on larger workloads. While Marc got an “A” for charm and for effort, his organizational skills were lacking. As his rolodex expanded and responsibilities mounted, maintaining his connections grew more difficult. He began to forget meetings, lapse in his communication with the home office, and overlook key customer information. The stress of trying to close deals, combined with the new and increased workload, was too much. The next time I ran into Marc, it was 2010. He’d given up real estate out of frustration – just as the economy was pulling through. Why tell you about Marc Roberts? Because he perfectly illustrates why a real estate CRM is more relevant than ever. With access to the boundless capacity of customer relationship software, my old buddy would likely be a top broker (and top earner) for whichever company was lucky enough to call him an employee. Today we’re going to cover the five crucial ways to put your real estate CRM to work for you and your real estate team. I’m not saying that there’s a Marc Roberts in your midst right now, only that organization doesn’t come standard. And missed opportunities are costly. Whether you use a CRM or not, we all benefit from a helping hand when it comes to reaching more people, improving team collaboration, and maximizing every lead. Exclusive Bonus: Download this FREE Checklist full of insights about the features you NEED to get the most from your CRM! What is a Real Estate CRM? Customer relationship management, known as CRM, refers to software technology that helps companies track, manage, and analyze interactions with their contacts. Whether prospective or current customers, CRM allows users to compile information across all communication and marketing channels in order to gain insights and better perform their business. For example, real estate agents can track their prospects, leads, properties, comps and more. As early as 1995, CRMs were improving customer relations and company organization. Beyond streamlining communications and tracking leads, customer relationship management is a strategy used by leading firms for developing stronger relationships with their incoming and best customers. Nucleus Research reports that CRM software application deliver high an average ROI of $8.71 per dollar spent. How can we understand this? When workflows become more efficient and customer relations become more effective, ROI increases. As datasets grow in size, the internet of things expands, and new communication channels (social media, anyone?) evolves, we can expect the ROI for CRM to increase as well. Now, here’s the 5 ways to max out that ROI. As you can imagine, a CRM excels at managing existing contacts and keeping track of day-to-day activity agents needs to close deals. But what about bringing in new business? “It always starts with the open homes. As soon as I meet someone who is an owner or potential seller, I’ll add them to my database. It’s important to remember: only add qualified prospects to your database. Unqualified leads are a dead weight in your system and will dilute your marketing efforts, wasting valuable time later. In the real estate industry, we develop interpersonal relations with customers. How we interact with customers throughout their buyer’s journey makes all the difference in the quality and outcome of the relationship. Because prospects arrive through varied channels – such as referrals, social media platforms, direct mail, cold calling, and spheres of influence – it’s key to segment your customers. So you can communicate them via their preferred channel in a language they respond to. Because communication capabilities are increased, segmented customer lists translate into better targeting and more effective marketing messaging. Managing and sending such diverse lead information without a CRM is a nightmare. But a cloud-based database can be updated from any mobile device allows brokers to input prospect and customer information on the fly and access it from anywhere, anytime. Brokers may segment contacts in their database according to select criteria, browse through centrally managed listings, create, publish, and syndicate listings, and automate activities such as email outreach, meeting follow-ups, and events. For example, say you’re hosting an open house for a ranch home in the low 500,000s. It only makes sense to invite the leads you have within a certain geographic area, age range, financial range, and who’ve shown interest in ranch style homes. Every other lead who receives a message from you about such an open house will annoyed. If you’re reaching them through email and this happens enough, they may even unsubscribe from your emails. Buyers — These people are in the market and doing research, but haven’t found the right property yet and haven’t made it to a buying position yet. ‘A’ Buyers — These people are currently making offers, going to auctions, and taking out contracts. Owners — Home owners who could benefit from future services as clients. May be able to refer customers if solicited. Sellers — Home owners who intend to make a move and sell property within a designated window, say the next three months. If you’ve worked in the real estate industry for awhile, you know that leads come from various sources. Some arrive via Facebook, others from word of mouth, and some are attracted by print advertising. Heck, some are walk-ins. My point is, you talk to leads differently depending upon the lead source. Use your real estate CRM to track the effectiveness of your marketing efforts. Of course, certain channels will perform better. Having everything documented in one place and accessible to brokers makes data input and tracking easy. All you need to do is pop into the reports section and see which efforts are performing best. Once you’ve pinpointed your best marketing channels, you can invest more heavily in those mediums while refining your overall marketing strategy. This is how you maximize marketing efforts and get the best ROI from your CRM. This chart displays the most successful social media channels for capturing leads, as researched by ReThink. These days, consumers expect to be treated as unique and individual. AgilOne Marketing reports that 79% of customers expect a personalized buying experience. And what could be more personal than buying a home? In real estate especially, companies are finding that communications that create one-of-a-kind relations with prospects net more purchases. For example, everyone loves to see their own name, right? Use your real estate CRM system to send automated emails with subject lines and body copy that greets leads by their first name. Readers prioritize marketing messages that give them a boost from seeing their name print. You can get even more creative by using demographic information to reach the right customers at the right time. Selling to those urban 30 somethings – the millennials? Bring these customers into your sphere of influence with social media. Share neighborhoods features, such as you grabbing a latte at that awesome coffee shop nearby, or you in the beautiful park around the corner. These posts will create interest and relevance for younger buyers. Try aggregating such content via email newsletters that link to your Instagram, a Facebook page, or Twitter. Blasting a single message out doesn’t work anymore. Marketing today is about more personalized, one-to-one relationships with your chosen audience. CRMs allow you to segment your customers and then perfect a personalized language for pinpoint targeting. Your real estate company’s revenues depend upon sales, sure, but also upon the work that leads to closing a deal. Productivity – how effectively and efficiently this work is completed – hinges upon proper planning. This is where Marc Roberts fell short. And with mobile usership up, the need for on-the-go productivity is higher than ever. A good real estate CRM helps you manage company time by planning for days, weeks, months and years to come. It’s the ultimate planning and coordinating tool. Cloud-based software makes it easy for team members to input and store customer information from anywhere, collaborate together, and stay on track with all responsibilities. Yearly — Schedule in employee vacation time, potential dates for client parties or other events you’ve planned. Monthly — Input personal and business commitments such as events and activities. Daily — Prioritize tasks and begin with what’s most important. Ultimately, having your brokers on the same page every calendar day means a more efficient office staff and more effective sales team. As a paperless solution, a real estate CRM increases your ability to get and keep documents, signatures, and share materials between teammates. Third-party apps and plugins are easily integrated as well, so you can automate emails, capture phone calls, complete online mapping, and utilize leading marketing software with ease. Expect your task completion time to decrease and tasks completed to increase as everyone knows what’s required of them. If you’ve reached this point, you’ll never suffer the disorganized fate of Marc Roberts. When starting out with a real estate CRM, you’re looking to close more deals, to reach more prospects, and to improve company workflows. Naturally, it takes time to get used to having these capabilities within reach. And organization is only the tip of the iceberg. First off, you’ve noticed that being able to centrally manage your listings is powerful, both for lead management and team productivity. But delving deeper into your CRM, you find that marketing will become more streamlined, reports are available to review your efforts, documents are more easily managed, and processes generally become easier. Faster too. Until next time, onwards and upwards! We all remember the days when internet was a mysterious tool that was only accessible in libraries or public buildings on slow dial up modem connections. Nowadays it is a critical part of modern life – both at home and at work. The internet has certainly improved the way we conduct our business affairs. Everything is more efficient and people and resources are so much more accessible thanks to the immediate connectivity the internet offers. Numerous industries such as the financial services sector have been changed beyond recognition thanks to the internet. For example, many “FinTech” (financial services technology) advancements have been made over the past few years with hundreds if not thousands of FinTech companies sprouting up to offer internet services to the financial services community. Indeed there has been a huge wave of digital disruption in the FinTech world recently that has reshaped the entire sector. On the other hand, the Real Estate sector is still in its early stages of adopting technology and the web. The term “PropTech” is starting to be used (we at RealSpace attended a very informative PropTech conference in London earlier this year) and a handful of companies have in recent years started providing internet technology services to the real estate sector. However the level of adoption of property technology by real estate professionals still remains relatively low compared to other sectors. Real Estate Agents and Brokers are only recently starting to appreciate and understand how adopting the latest in technological advancements can help them improve their day-to-day business activities. As an example, previous offline business processes, such as generating and following up with leads, can now be taken online and automated to improve efficiency in nurturing and interacting with prospective buyers, landlords and tenants. Similarly, with the increased usage of property portals as the starting point to search for a new home, it is becoming more and more critical for real estate agents and brokers to make sure they have exposure for their listings on as many of these sites as possible. This is where listing syndication tools offered by real estate management softwares can become integral and vital to a real estate professional’s business. Those agents and brokers who have already started adopting technology to help them in their day-to-day activities have quickly realised the many benefits that this can bring to their business. We at RealSpace have dedicated the past 4 years to product development to bring to market a real estate software that addresses all of the critical issues that – when made more efficient via the adoption of internet technology – can make a huge impact to a real estate agent. Our ultimate goal at RealSpace is to change the real estate industry for the better for all stakeholders: agents, brokers, property managers and developers (our clients) and end users: buyers, owners and tenants. Through various intuitive and market leading innovations such as workflow automation, drip marketing, real-time data syndication between portals and software, automatic rating and quality scores for listings and leads, transaction timeline and compliance management and so much more, RealSpace offers a complete software solution for the real estate industry. We believe that the real estate industry is set for a huge disruption and improvement over the coming years and we at RealSpace hope to be at the forefront of this new chapter in the evolution of real estate products and services. The next-generation software for Property Managers has arrived! RealSpace is an industry-leading cloud-based software empowering real estate professionals to effectively manage all aspects of running their business online. Copyright © 2019 RealSpace Software Ltd.